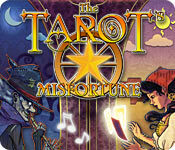 The Tarot's Misfortune is rated 3.5 out of 5 by 6. Rated 5 out of 5 by magfan from More than the sum of its parts The Tarot's Misfortune is one of very few of my older HOG's (hidden object games) that I've played more than once. In fact, I've replayed it several times. It's a game that somehow adds up to more than the sum of it's parts -- at least for me. The overall atmosphere is what puts playing the game a step above most older HOG's. The plot is relatively simple -- An evil guy has placed a spell on the town. You play the fortune teller, Rosalie, the only person in town unaffected by the spell, and it is up to you to break the spell and free the townsfolk. On the surface, it's a simple HOG with a few fairly easy spot-the-difference puzzles. Occasionally you use the objects you find in the game environments, so the game could be considered an IHOG instead of a straight HOG. The music is different for different "chapters" of the game, and some of it is excellent. There are 3 musical themes that cycle with the chapters, as well as the one that plays at the game menu. The environments are brightly colored, with subtle animations. Despite the game taking place at night, I had no trouble seeing. Usually I don't care much for HOG's without puzzles, but this game is an exception. If you like the look of the graphics, it's worth playing through the demo to see if it "grabs" you. Rated 4 out of 5 by RavenCorbie from Fun Casual Game This is a review of The Tarot Misfortune, Standard Edition for PC, which I completed in full on 03/28/2017. GAMEPLAY: The gameplay is pretty basic. At the beginning of each chapter, you turn over 3 Tarot cards, and the narrator gives an explanation of what each card means and a very vague idea of what you need to do (for example, explore other areas, stay focused, etc.). Then, you will have a number of HO scenes and occasionally the use of one or more inventory items to unlock a new location. In most HO scenes, there are a number of colored Tarot cards to find -- that is, you are seeing the back of the card, and in different colors (red, purple, blue, green, etc.). You also need to find other objects. Occasionally one or more of the objects you find in an HO scene will become inventory items that you can use at the same or a different location, but they don’t become inventory items until the HO scene is over. In some locations, there is a glowing Tarot card. If you click it, you get a “find the differences” puzzle between two versions of the same card. Finding all the differences gives you a clear hint about an obstacle later in the game. I liked doing these, so I don’t know how difficult it would have been to figure out what to do without the hint, but I don’t think it would be impossible. 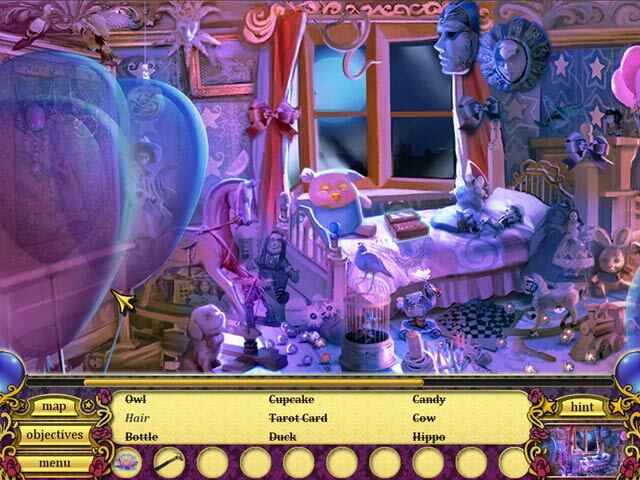 At the very end, there is a multi-stage mini-game to defeat the Magician. CHALLENGE: There was not much challenge in this game. Occasionally, I used the hint button, but only when feeling lazy, not when feeling completely stumped. The main challenge is sometimes seeing open “doors” to other areas. The Forest Camp area is particularly difficult to notice if you aren’t aware that it exists. The mini-game at the end is laughably easy. STORYLINE: The storyline is also pretty basic. You “wake up” in jail to find out a magician has enslaved the rest of the town. You are also missing most of your Tarot cards that the Magician has spread all over town. You have to find the cards and use them to defeat the magician. At the end, there is a final mini-game to defeat the Magician. The tone is very much sweetness-and-fluff both in terms of the artwork and in terms of the theme. OPTIONS: There are very few options: music and sound effect volume, custom cursor, and full screen. Of particular note, there are NO difficulty settings. AESTHETICS: The aesthetic is, as I mentioned in the “Storyline” section, very light. Yes, there is a Tarot theme, which some associate with darkness and the occult, but here, it is very far from that side of Tarot and witchcraft. The colors are very bright. There is no voice acting, and the music is very repetitive, but pleasant. I did turn both the sound effects and the music down quite considerably. Finally, there are the cards themselves. They are very beautiful and also family friendly. Of particular note, at the end of the game, you can click on cards to see the credits. I normally don’t care much about seeing the credits, but I enjoyed this version. Final Assessment: I enjoyed this game, but not as much as others. It was simple and very casual. The story was engaging, but not compelling. I liked finding the Tarot cards in the HO scenes. So I recommend this game, ideally on sale or with game credit. There’s nothing bad about the game, but it’s not amazing either. CE or no? As far as I know, there is no Collector’s Edition of this game. 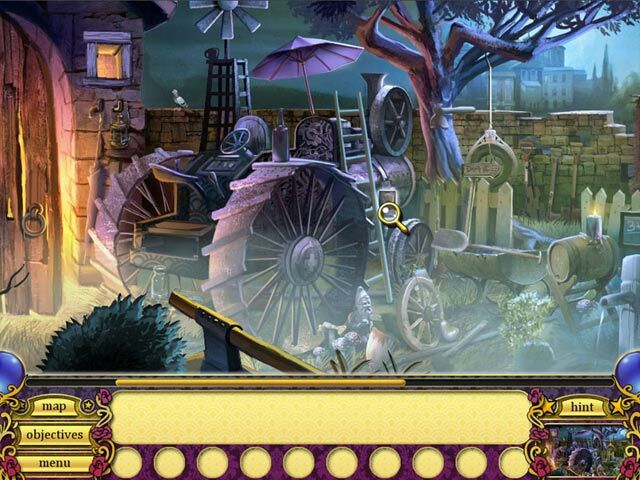 Rated 4 out of 5 by mrm2006 from A Tarot Reader in Trouble Storyline: You are a tarot card reader. You will danger lurking. It's late at night and someone comes knocking at your door. You mention the late hour but you will still read the creepy guy's cards. She turns the card over and tells him that he is in danger. He laughs, evilly, and tells her that no, she is the one in danger. Next, she wakes in a jail cell. Now, she has to use her wits, the clues her tarot cards provide and find her way not only out of the cell, but to find all her missing cards and this turns into one misadventure after another. Graphics: Not great. Everything is much too dark and dreary. I realize the game is based on the premise of dark and dreary but this goes way beyond what is necessary. Sound: There are really no sound effects other than a noise that's made when you find an item. The background music is haunting and on a loop. Game Play: You go from room to room and place to place playing HOGs everywhere you go, collecting inventory items that you have to figure out not only how to use but where to use it/them. Once you've accomplished that you can move on to the next location. HOGs: This is an HOG heavy game. Every room/place you go there is an HOG. Some items you may find there, others you have to find in another place entirely (meaning you will get an inventory item to use, like a hammer to smash the barrels) but there is no given direction. The storyline is good. Find all the missing tarot cards. There is a map that shows places unlocked but it is not transportable. Actually, it's pretty useless. You have a journal that is also fairly useless and the objectives are moot. Basiclly, you are on your own. The hint button recharges remarkably fast and you will need it in the HOGs because everything is too monochromatic in color and tiny to find. This was a mysterious and intriguing game. But the difficulty in finding HOG items because they were so small and the uselessness of the map leans me to not purchasing this game. However, I encourage everyone to at least try it. It's free and it's an hour of game time. You may enjoy it more than I. Happy Gaming Everyone!! Rated 3 out of 5 by qpqt from Glad I Purchased This On Sale There are 2 good things about this game -- the hint recharges very quickly (you're going to need it) and there are no penalties for mis-clicks (you're going to need those too). The objects are not very detailed and often are obscured by other objects or are very tiny. I used the hint button much more than I prefer. Why am I playing the game when I need the hint button so much? There are too many scenes that are foggy, making the objects even more difficult to pick out. When a scene is complete, you are told it is complete. But as the other reviewer stated, you are not given instructions or even a hint as to what to do next -- so more clicking to find your way, or, as I had to do a few times, go to the walkthrough. I never really got into the story line. It is not very interesting. You just go from scene to scene with no real purpose to look for hidden objects. There are several spot the difference puzzles -- find 5 differences between 2 pictures, but few other mini games. I cannot really recommend this game, however, you can try the demo. Maybe you will have a different and better impression of it than I have. Rated 3 out of 5 by Laflamme from Very basic IHOG Review upon finishing the game. As far as I remember this was one of the first IHOGs, when you first collected some things out of a HO scene that you had to use elsewhere - so this is as basic as a IHOG can get. In this case, stars tell you where you have to place your objects, and once you click the item either snaps into the correct place or a silhouette tells it for you. 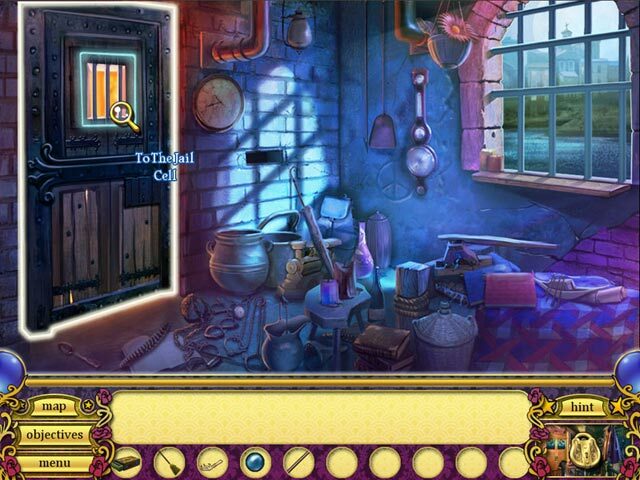 The Good: + graphics adequate + storyline not run-of-the-mill + areas no longer relevant to the storyline are locked (although sometimes it's still not clear where to go next) + useful globe indicator on the left and right sides for placement of hidden objects The Neutral: o mini games only consist of finding 5 differences on tarot cards (the rest are more or less auto-solved) o game not overly difficult The Bad: - storyline moves too fast (missed some of it) - what did the bad guy even want? - lame final showdown minigame - some items hard to find in a little foggy areas Bottom Line: Game mechanics moved on a lot since this game was published, so I can only recommend it for a sale. Rated 2 out of 5 by AverageSizeFish from Abysmal This is not a classic HOp. If it were I would like it. It's a very poorly put together game which doesn't function very well. It may be that it's deficiencies are caused by it's age. Don't bother with it. It's horrible.